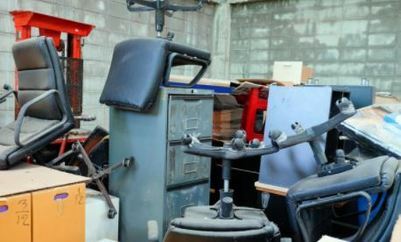 At South Bend Junk Removal, our goal is to help you get rid of your unwanted junk. We are here to serve all of your disposal needs and offer a wide variety of pickup services. These services include home junk pickup, office junk pickup, specialty junk hauling services, and seasonal hauling services. All of the services we provide are custom tailored to your needs and available at outstanding prices. Our office junk pickup service has become very popular with corporations, companies, and businesses alike. Whether you're looking to clean house, to move to another location or just want to clear out some old storage areas, we offer services to help. Our office pickup service entails Computer Monitor Disposal, Computer Recycling, Cubical Removal, Electronics Recycling, Office Furniture Removal and Printer Disposal. With our Computer Monitor Disposal service, we offer the ability to dispose of all of your old computer monitors. Whether they are the old school, bulky monitors or broken flat screen monitors, we will get them all out of your offices. We also offer computer recycling. Computer recycling is the reprocessing and reuse of laptop or desktop computers that have been discarded or unusable. We recycle computers and other electronics of that nature to reduce landfills, conserve resources and promote optimal environmental health. Computers are made of various materials such as silicon, lead, chromium, and various other reusable materials. Why discard these things when they can be re-used in a new product. At South Bend Junk removal, we want to do our part in conserving resources and saving the planet. We also offer the same recycling service for other electronics and printers as well. The recycling process is very straightforward. We collect the items we will be recycling. Then we sort the items for similarities. Then we test the items to see if they are still usable or somewhat usable. Then we manually disassemble and completely destroy all the data or hard drives present. Then we separate the materials into its material composition to be reused. It is a very beneficial process for all parties involved. We also offer cubical removal and office furniture removal services as well. We will take all of your old office cubicles and old office furniture off your hands. It doesn’t matter if your place of business is on the first floor or the twentieth floor, we will handle all of the heavy lifting. You won’t have to lift a finger. Even though our Office Junk Pickup Service is pretty straightforward, we still do get some general questions about our services. The question really should be what can’t we take away? From furniture and general garbage to appliances and even hot tubs, we can handle pretty much all of your junk removal needs. Generally, if you have questions about our ability to take it, feel free to contact us! Upon calling us during our hours of operation, our team members will be in contact with you the same day and will be able to arrive usually within a two-hour window to take all of your junk away. What Do You Do With The Trash? We do our best to donate anything that is salvageable to local charities. Everything else we take to the proper locations for disposal. If you have any other questions or concerns, feel free to contact us. We are here to get rid of all of your unwanted junk. You point, it disappears. Call us today!